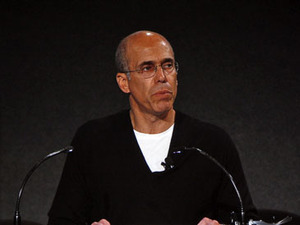 Katzenberg jointly announced the InTru 3D brand with James and said that beginning in March 2009, all DreamWorks releases will be available in both 2D and 3D. 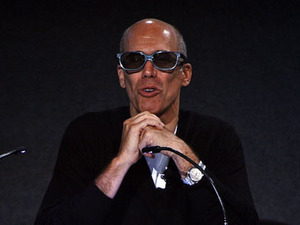 He continued by saying that all of the films would be recorded in 3D initially and you’ll be able to view the animated films though polarised glasses (as modelled by Katzenberg himself) in one of over 5,500 cinemas that already have RealD Cinema technology already installed. One thing to note though is that movie theatres will need to acquire a new projector that’s able to propel the 3D scenes onto the screen before they can show DreamWorks’ new creations in 3D. To demonstrate the new technology, we were shown an action-filled sequence from Kung Fu Panda that was specially re-mastered in 3D for IDF. Following this, we were shown a trailer from Monsters vs. Aliens that’s never been seen in public before and I have to say I was impressed with the level of immersion. The film will be released on 27th March in the USA, but Katzenberg didn’t go into detail on when we can expect a European release. I can’t wait to see the full movie, if I’m honest – the trailer served as a great teaser of things to come. I do have some concerns, though. First of all, the glasses weren’t exactly comfortable and even though they were much better than 3D glasses of times past, I still found myself suffering from a slight headache during the trailer. Maybe it’s something that goes away over time after you get used to the 3Dness of the motion picture. Secondly, I’m concerned that this newfound technology will be abused, with both animators and producers forgetting what makes a great film because they’re so focused on making the thing look great in 3D. The same has happened with many modern-generation games trying to take advantage of spangly new graphical effects – the developer focuses too much on making the game pretty and then forgets to make it playable.